An irresistible novel about food, desire, and the real-life love triangle between M.F.K. Fisher, her husband, and the man she left him for, the true love of her life. Los Angeles, 1934. Mary Frances is on the cusp of becoming M.F.K. Fisher—the writer whose artful personal essays about food created a genre. Young, restlessly married, and returning from her first sojourn in France, she is hungry, and not just for food: She begins writing to impress friend and neighbor Tim, who seems to understand her better than anyone. Mary Frances and her husband, Al, no longer share the things that once bound them together—a good glass of wine, a fine meal, their creative and passionate energy. After a night’s transgression, it’s only a matter of time before Mary Frances claims what she truly wants, plunging all three of them into a tangled triangle of affection that will have far-reaching effects on their families, their careers, and their lives. 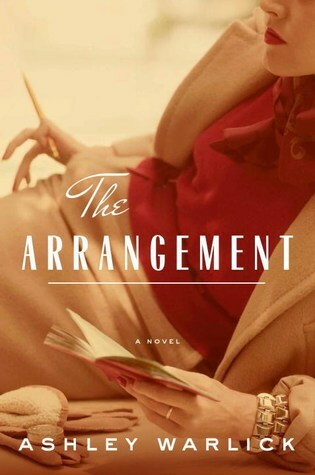 Set in California, France, and the Swiss Alps, The Arrangement is a sparkling, sensual, and completely enveloping story of love, passion, and a woman well ahead of her time, who had the courage to be—and to take—exactly who she wanted. I like the vintage looking cover.